Spectacular volcanoes and fabulous highland lakes form a brilliant backdrop to our Guatemala – Volcano Birding tour. While this region is probably best-known for its shade coffee production, residents have embraced ecotourism in a way that has fostered an environmental bond and resulted in much of the highland forests being protected. Visit fantastic reserves and signature coffee fincas, and see a magnificent array of special birds, including a search for one of the world’s most prized species: the odd and beautiful Horned Guan. Throw in some other dazzlers like the gorgeous Pink-headed Warbler, the legendary Resplendent Quetzal, Blue-throated Motmot, Blue-and-white Mockingbird, Rufous-collared Thrush and Cabanis’s (Azure-rumped) Tanager, and you have the makings of an unforgettable Impact Adventure. 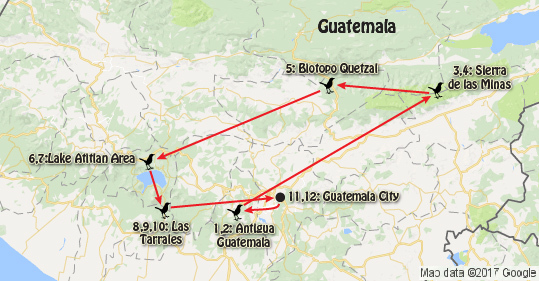 This Volcano Birding tour offers the very best of Guatemalan birding, along with comfortable lodgings, delicious fare and fabulous scenery throughout! Horned Guan, Resplendent Quetzal, Pink-headed Warbler, Blue-throated Motmot, Blue-and-white Mockingbird, Rufous-collared Thrush and Cabanis’s (Azure-rumped) Tanager. Hot at times – and mosquitos and other insects can be a nuisance occasionally. Lake Atitlán, Antigua and Baroque architecture, Guatemala City, coffee, Audubon-trained guides and community hosts.